Sir John Digby (1603 - 1684) ought to be noted as a brave Cavalier who fought for his king in the English Civil War. His family were a cadet branch of the Digbys of Coleshill, Warwickshire, and he was probably born at their family home, Mansfield Woodhouse Manor (also known as 'Woodhouse Castle') in the year the Stuarts came to the throne of England. Appointed High Sheriff of the county, Digby was knighted by Charles I at Newark on July 12 1642, some weeks before the King raised his standard at Nottingham (August 22). 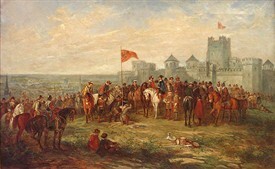 Earlier in August Digby, the Lord Lieutenant, Lord Newark, and a troop of cavalry had tried to seize the county magazine (Nottingham Castle arsenal) for the Royalists, but were at first prevented by local Roundheads including John Hutchinson, later Parliamentarian Governor of Nottingham. 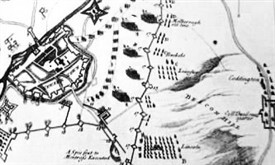 When the King approached the city with more troops, Sir John managed to take the magazine, but was not very successful in persuading the Nottingham trained bands (militia) to join the Royalist side, only a handful coming forward. Although he was not as important as other local gentry like the Earl of Newcastle and Sir John Byron, both of whom were given high commands and raised large units for the king, Digby was present at the first major battle, Edgehill in Warwickshire, on October 23rd. Returning to Newark immediately after that indecisive fight he hoped to secure the whole county for Charles, but Nottingham itself was already securely held by Parliament. He managed, however, to contribute at least 400 men to the Royalist garrison of Newark, forming the basis of a regiment of which he was Colonel. He and this unit then served throughout the three famous sieges of Newark (1643 - 1646), assisting the Governor Sir John Henderson. I sate in the stocks and they threw stones at me. After some time they had me before the magistrate, at a knight's house [i.e. 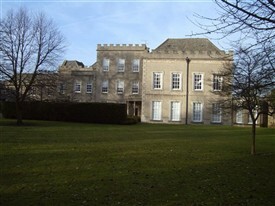 Sir John's Woodhouse Manor], where were many great persons; who seeing how evilly I had been used, after much threatening set me at liberty. In July 1659 Digby was ready to join a plot led by Lord Byron to recapture the county for Charles II, but this did not come off. General Monk actually marched through Mansfield and Nottingham on his way from Scotland to London when he successfully restored that King in January the following year. Sir John reached the good age of 81, dying in 1684. 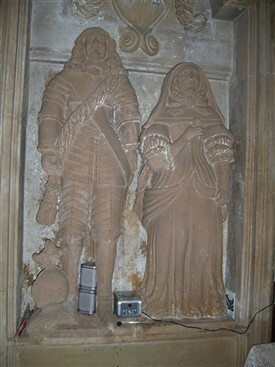 His wife Lucy, daughter of Thomas Trygget of South Kirkby, near Wakefield, West Yorks, lived to 89 and was buried beside him at St Edmund's church in Woodhouse. Their son, also called John, succeeded his father as High Sheriff, and his grandson was MP for the county. Lord Clarendon in his History of the Great Rebellion described Sir John Digby as 'a man rather cordial [i.e. enthusiastic] in the service than equal to the command', which seems a little unfair on someone who fought right through the Civil Wars and made valiant efforts in a part of the country where the majority were against him. He deserves to be rather better-remembered and credited for his loyalty to the Stuarts. This page was added by Ralph Lloyd-Jones on 05/02/2014.